Mushrooms are a delicacy of autumn, with their many varieties growing in the ground or on trees. 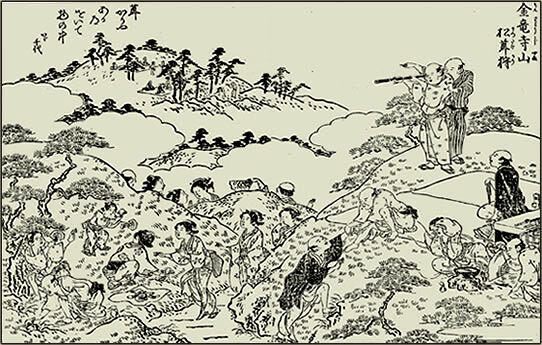 Let us look at some kigo with these "children of the trees" ki no ko, take　茸. ..... one of the most expensive ! ..... Many farmers grow them on old logs behind the barn, for the family delight. more dishes are in the WASHOKU saijiki. Autumn is a wonderful season to walk in the woods, where mushrooms spring up like little miracles from their invisible parent plants. 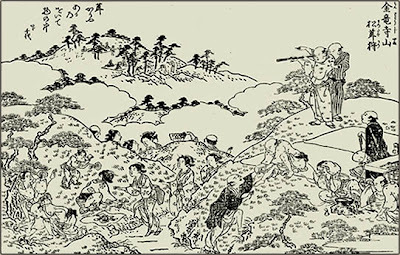 Mushroom-hunting is very popular in Japan, but when the tasty kuritake, or chestnut mushroom, appears, hunters know that the end of the season is nigh. 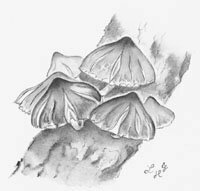 This attractive species (Naematoloma sublateritium) grows in clusters of up to 20 on the dead stumps of trees, such as chestnuts and oaks. The tops of their caps are a brick red color fading to a creamy yellow, and as the mushrooms age, the caps often split to reveal slashes of white flesh. Unlike green plants, fungi cannot produce their own food and rely on ready-made carbohydrates from the environment around them. This means that they are either parasites or saprophytes, feeding on either living or dead organic matter, such as trees and plants. Chestnut mushrooms are saprophytes, a group that helps in the vital work of recycling the forest. Sometimes people mistake the bitter yellow nigakuritake (the sulfur tuft or N. fasciculare ) for a chestnut mushroom, which is unfortunate because it is deadly poisonous. Yukiwaritake 雪割茸 (ゆきわりたけ) "snow splitting mushroom"
speciality of Hokkaido. Biologically, it is not clear what kind of family this belongs to, maybe a kind of enoki or nameko. A small, amber-brown mushroom with a slightly gelatinous coating, It is enjoyed in miso soup and nabemono hodgepodges. Written in the autumn of 1689 元禄2年晩秋. Basho had returned from his trip to "Oku no Hosomichi" and spent some time in his hometown, Iga Ueno. This hokku is either from real experience or a poem for a painting. Maybe he was out gathering mushrooms and just made it home in time.
. matsutake ya kabureta hodo wa matsu no nari . Read the discussion evolving about the translation of this haiku ! At the home of Taisui 岱水 in Fukagawa. 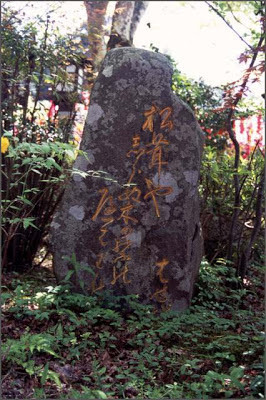 Taisui lived close to Basho and they had frequent haikai meetings. It is only a few days since the beginning of autumn, but the mushrooms are already out and full of delicious dewdrops. "It can be argued that the haiku alludes to feminine beauty."
. beni tengutake 紅天狗茸 Amanita muscaria . A very poisonous mushroom, also called "the Death Cup".
. . . CLICK here for toadstool Photos ! In Japanese as in English, this haiku reads as a simple declarative sentence that depicts, in simple terms, a simple scene. Is it too simple, too mundane to be considered poetry? Or is it poetry precisely because of its simplicity, because of Issa's patient attention to a here-and-now scene that others might overlook? The reader must decide. They've always tickled my imagination (and taste good besides!). I saw as a child?